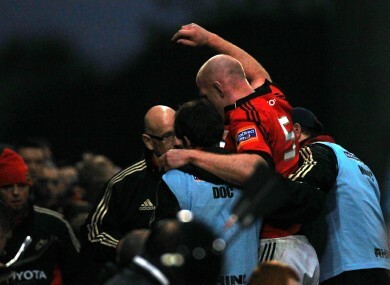 Munster's Paul O'Connell is helped from the field. A MUNSTER WIN at Thomond Park was marred somewhat by the sight of the home captain being helped from the pitch after he injured his knee in the closing stages. Paul O’Connell was caught up in a tangle of bodies as both Munster and Ulster contested a breakdown in the Saturday evening RaboDirect Pro12 match. O’Connell appeared to arch his back as a spasm of pain kicked in and an anguished cry could be heard loudly in the stands. The lock received treatment on the pitch before being helped off by two medical assistants. O’Connell was out for over a year after suffering an infection to the pubic symphysis in 2010. The 32-year-old twisted his left knee-cap against France earlier in the season to miss the remainder of the Six Nations. Speaking after the match RTÉ analyst Alan Quinlan said he hoped O’Connell had not injury his cruciate ligament. Hopefully it is just the medial ligament, which he’s had in the past, and he’ll be out for (just) a few weeks. Munster forwards coach Anthony Foley commented that it was too early to assess O’Connell’s match-ending injury. Ireland travel to play New Zealand in June as part of a three-Test match tour. Declan Kidney and Les Kiss were in the stands at Thomond Park at looked duly concerned as O’Connell was being assisted off the field of play. Munster are slotted in to play Ospreys in the Pro12 semi-finals next Friday. Email “Injury could rule O'Connell out of Pro12 semi and Ireland's tour to New Zealand”. Feedback on “Injury could rule O'Connell out of Pro12 semi and Ireland's tour to New Zealand”.